A particularly kooky & fun set of statements from Janet & her friend Michelle this week. Feel free to do your best armchair analysis of me. 1. When I'm sick I'm a martyr to rival Joan of Arc. 2. When I take a walk, I think about how I would much rather be riding or driving, or maybe just back in my warm bed instead of walking. 3. Money can't buy happiness but it can take the edge off unhappiness. 4. Cotton makes me cozy and leather makes me think of cowboys. 5. The strangest person I've had lewd thoughts about was Tony Soprano. 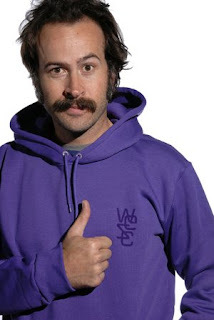 Or maybe Jason Lee. 6. My favorite color these days is scarlet because it's bold & intense (School starts Tuesday! I am revving up my boldness & intensity...). 7. And as for the weekend, tonight I’m looking forward to nothing in particular (bliss! ), tomorrow my plans include breakfast with a friend and Sunday, I want to watch more football. and the holiday? - Enjoy! You said football. Please don't say football. I'm looking at my calendar and making sure our WALKING plan works - I think it will. It will be superfun. Or at least good for us. Should I confess that I have had several dreams where I was Tony Soprano's girlfriend? I don't find him overly attractive, but I guess my subconscious does! Yay! Football-watching Sundays. Can't get much better than that!! Happy Labor Day Weekend. I've been very tardy in my blog reading, but I noticed that your birthday has come and gone. Happy belated B-Day, Bad Mom! I'm going to remember your #3 for a long, long time. Genius! I was SO hoping that you'd had lewd thoughts about me. Le sigh. That Tony Soprano thing really throws you for a loop, doesn't it?! Yes! It certainly does! I'd rather be unhappy married to a rich man than unhappy married to a poor man. Know what I'm sayin?